Description: Our adventurous princess, Rapunzel, wants to discover the secrets of the beauty world and needs your help to get a makeover. Join Rapunzel in her tower and start using the professional spa products to clean up her face. 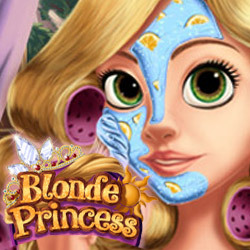 Experiment with different eyeshadows, lipsticks and blushes to create a special look for the blonde princess. Finish the transformation by choosing a cute hairstyle and dress so that Rapunzel can go on another adventure.